← Why Write ABout Old Ladies Behaving Badly? I am a raised-Catholic agnostic who prays, to who(m) or what I pray I can not say. Writing on my screen porch just now, two women with bibles drove up and spoke to me through the screen. “May we recite a passage from scripture?” the taller one asked through the screen. I read the following unfinished paragraph about three women, two old lesbians and their aging niece, praying at the bedside of one of the women’s father who has just died. I can’t remember the next few lines, but when she was finished, we all just hung there thinking our private thoughts for a moment. Then we all smiled. I have no idea, what, if anything this encounter means, a little prayer, each in our own way, in the middle of the working day maybe. I was raised staunch-Catholic and later turned away from religion altogether, which made my dear old Ma thump her good book even harder (seriously, she’s like a one-woman STOMP revival). As I like to say after Sunday dinners at her house: “Well, it was an interesting experience and no one got hurt.” So, I’m glad no one got hurt. Looking forward to your next book. Happy writing! Ha, thanks for making me laugh, because yes, it’s true, people have gotten hurt by religion, but not today, not on my screen porch anyway. Happy writing and happy spring. Thanks Sally. Thanks for reading! Hi Sally! This is just fantastic — now I know what to say when the bible thumpers come to my door — thank you, your writing is amazing. Hi Jane! Thanks. Hooray for spring and screen porch writing. May all you prayers come true – smiley face. As always, you are kind and thoughtful with people and your writings. Better than me with those who come to the door to sell Jesus /God. Looking forward to your next book. Thanks Sheri, So good of you to read this. I am looking forward to finishing this book – slow I am. Happy Spring. Reading this lovely piece just reminded me of a colleague coming into my office to ask if she could pray with me. She gave me two business cards–one said something like, “God has big plans for you!” (I still have those cards in my wallet. What the heck–it can’t hurt.) At the time I had a story coming out in a lesbian erotica anthology, and I wondered if that was part of God’s plan. (I’d like to think that it was.) Oh–re: old ladies behaving badly, have you read/heard of the book Sister Gin, by June Arnold? Thanks for reading and commenting, Carol. I love that you still have the card. I did read Sister Gin – an interesting book. I am of the firm belief that lesbian erotica is part of God’s plan. Can’t wait to read your forthcoming novel. 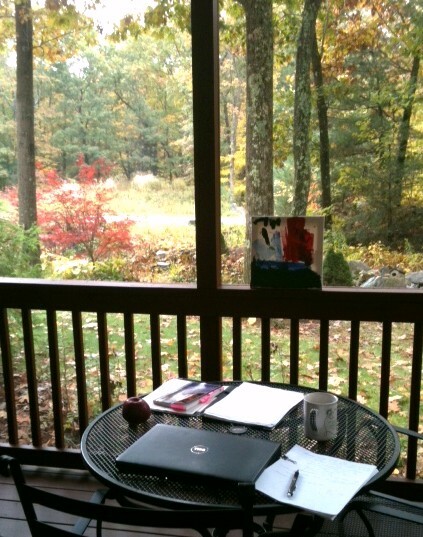 Oh my dear Sally, I looked longingly at the picture of your writing table, the porch, the view and missed you even more. My heart filled with how gently you dealt with the women who entered your sacred space. You are brilliant and truly a good soul. I’m proud to call you my friend. I want to read everything you write – I’ll even grovel for discarded post it notes. Tears in my eyes – my beloved friend – miss you like crazy. Thank you for reading and being my friend across the miles. Love you, think of you daily.